Barkley carried 13 times for 38 yards and caught nine of 10 targets for an additional 73 yards during Sunday's 20-13 loss to the Redskins. Barkley rushed 14 times for 43 yards and a touchdown and caught nine of 10 targets for 51 receiving yards in Monday night's 23-20 loss to the Falcons. He also successfully ran in a two-point conversion. Barkley had 13 carries for 130 yards, including a 50-yard touchdown, in Thursday's 34-13 loss to the Eagles. He also caught nine of 12 targets for 99 more yards. Analysis: Barkley is game-flow-proof, quarterback-proof and offensive line-proof. He's a major weapon in the passing game and capable of taking a play to the house at any moment. 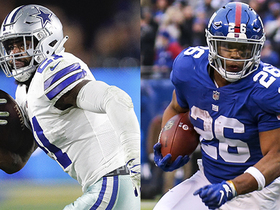 No matter how bad it gets for the Giants, a healthy Barkley is a top-five fantasy player. 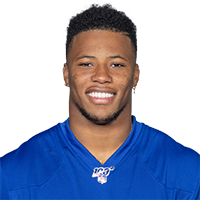 Barkley, who evidently tweaked his back late in Week 5 action, is "fine, healthy and ready to go," according to coach Pat Shurmur, Ralph Vacchiano of SportsNet New York reports. 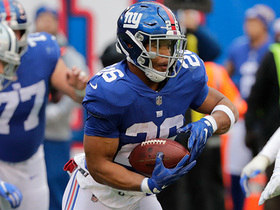 Analysis: It's great news for those stressing over the fact that Barkley came out of Sunday's 33-31 loss to the Panthers a little banged up, especially with the Giants playing again Thursday night against the Eagles. The No. 2 overall pick in the 2018 NFL Draft hauled in four passes for 81 yards and two scores, to go along with 15 carries for 48 more yards Sunday. Barkley told Jordan Raanan of ESPN.com after Sunday's 33-31 loss at Carolina that he "felt something in his back, not his knee or ankle" late in the contest. Analysis: At the conclusion of his second touchdown grab in the fourth quarter, Barkley took a big hit, per coach Pat Shurmur, but the nature of the injury wasn't known until Barkley himself spoke with the media. 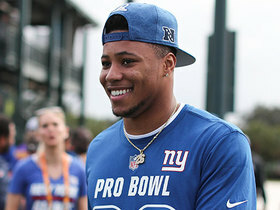 It doesn't appear serious at the moment, but the Giants are certain to provide a prompt update on Barkley's status with a short week to prepare for a Thursday night affair with the Eagles. Barkley, who had a monster game with four catches for 81 yards and two scores, to go along with 15 carries for 48 more yards, left the game with an apparent knee injury after scoring a go-ahead touchdown. According to ESPN's Jordan Raanan, Barkley was moving well after the game, and coach Pat Shurmur said he was fine. Analysis: We'll have to wait for confirmation that Barkley is indeed okay, but the early report is a good sign. 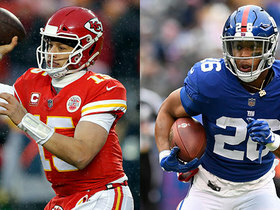 Barkley is already one of the league's best backs in a pure football sense, and despite playing behind a poor offensive line, also a top-tier fantasy option. Barkley had 10 carries for 44 yards and a score, and added six catches on eight targets for 56 more yards against the Saints on Sunday. 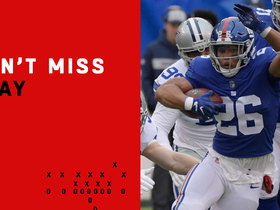 Analysis: Barkley is largely game-flow proof as the Giants use him in the passing game even when they're playing from behind. His upside is capped by the team's poor offense, but his usage floor is high, and he's done a nice job of breaking tackles and showing the speed and vision to get into open space. Barkley had 17 carries for 82 yards and a score and caught all five of his targets for 35 more yards during Sunday's win over the Texans. Analysis: Barkley's performance was better than the numbers as he constantly broke tackles and got himself into space even when the run wasn't entirely blocked. So far he's living up to his draft pedigree. 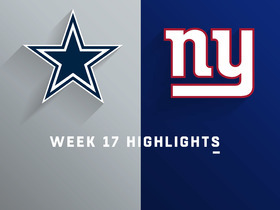 Barkley rushed 11 times for 28 yards and caught 14 of 16 targets for 80 yards during Sunday's 20-13 loss to the Cowboys. Barkley rushed 18 times for 106 yards and a touchdown while catching two of six targets for 18 yards in Sunday's season-opening 20-15 loss to the Jaguars. Analysis: Barkley was excellent in his NFL debut, breaking off a 68-yard touchdown run to make this game competitive in the fourth quarter. He didn't get much going as a receiver, but Barkley's six targets were encouraging as far as his future workload is concerned. 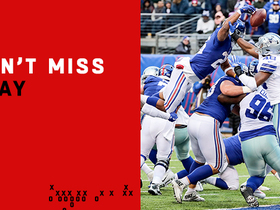 No other New York player registered more than two carries, suggesting Barkley's locked in as a three-down workhorse. Barkley (hamstring) isn't listed on Wednesday's injury report in advance of the Giants' Week 1 game against the Jaguars. Analysis: The hamstring injury limited Barkley to one appearance during the preseason, but he had been practicing in some capacity for the past couple weeks. The rookie confirmed Monday that he made a full recovery, allowing for a normal week of practice ahead of a difficult debut matchup. The Jaguars surrendered 116.3 rushing yards per game and 4.3 yards per carry last season, but only allowed 11 touchdowns (seven rushing) to running backs. Barkley (hamstring) relayed Monday that he's 100 percent in advance of Sunday's season opener against the Jaguars, Art Stapleton of The Bergen Record reports. Coach Pat Shurmur noted Monday that Barkley practiced well both Sunday and Monday. Analysis: Barkley is bouncing back from a hamstring issue, which will presumably keep him out of Thursday's preseason finale against the Patriots. He continues to practice without any setbacks, and at this stage there doesn't appear to be any concern regarding his availability for the Giants' regular-season opener Sept. 9 against the Jaguars. Barkley (hamstring) returned to team drills Sunday, Dan Salomone of the Giants' official site reports. Analysis: Barkley was seen taking handoffs and "effortlessly" catching passes, making it seem as if he's back to normal after sustaining a minor hamstring strain in practice Aug. 13. He and the the rest of the starting offense will probably be held out of Thursday's preseason finale against the Patriots, but there doesn't appear to be any concern regarding Barkley's availability for Week 1. Barkley (hamstring) confirmed Friday that he's on track to play Week 1, Josina Anderson of ESPN reports. Analysis: Barkley was limited to individual drills throughout the week and didn't suit up for Friday's preseason win over the Jets. He'll presumably be held out of the final exhibition contest, with his focus on getting as healthy as possible for a difficult Week 1 game against the Jaguars. The No. 2 overall pick will handle a heavy workload while Wayne Gallman and Jonathan Stewart compete for scraps. Barkley relayed Wednesday that his hamstring "feels pretty good." "I've been moving pretty well," Barkley said after practicing Wednesday in a limited fashion. "I don't want any setbacks at all and that's why I'm following the game plan." Analysis: The game plan Barkley refers to likely means that he'll be held out of Friday's preseason game against the Jets for precautionary purposes while he eases back in from the strained left hamstring. The rookie's Week 1 availability doesn't appear to be in any danger. Barkley (hamstring) returned to practice Wednesday in a limited capacity, taking part in individuals drills, Jordan Raanan of ESPN.com reports. Analysis: Barkley did some conditioning work on a side field Monday and now seems to be taking another step forward. The Giants likely will hold him out of Friday's preseason game against the Jets, but there doesn't seem to be much concern about his availability for Week 1. The next step for the No. 2 overall pick is a return to team drills in practice. Barkley (hamstring) didn't practice Tuesday, Ralph Vacchiano of SportsNet New York reports. Analysis: On the plus side, coach Pat Shurmur noted Tuesday that the rookie back is "doing more and more each day." That said, Barkley is considered unlikely to play in Friday's preseason game against the Jets. Barkley (hamstring) isn't practicing with his teammates Monday, but he appears to be moving and running without any problem while doing individual drills on a side field, Jordan Raanan of ESPN.com reports. Analysis: Monday marks a full week since Barkley suffered a mild hamstring strain, with his continued absence from practice suggesting he could be held out of Friday's preseason game against the Jets. 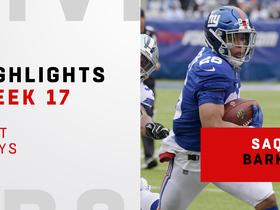 The prized rookie doesn't have anything to prove in terms of role or talent, and the Giants already saw him at work in a game setting when he took five carries for 43 yards in the first week of the preseason. Barkley has 20 days to get back to full strength for a difficult Week 1 matchup with the Jaguars. Barkley (hamstring) won't play in Friday's preseason game against the Lions, Ralph Vacchiano of SportsNet New York reports. Barkley (hamstring) didn't participate with the main group during the Giants' practice Thursday and was instead working out off to the side, Paul Schwartz of the New York Post reports. Barkley (hamstring) is on the field in uniform for Tuesday's practice, but he isn't wearing any pads, Ben Volin of The Boston Globe reports. 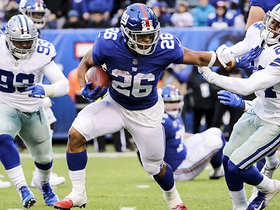 Analysis: While he's unlikely to do much besides watch his teammates, Barkley's presence on the field is another indicator that his hamstring injury isn't serious. The Giants referred to it as a "mild strain" after the rookie was removed from Monday's practice and spotted with a wrap on his left leg. Barkley, who is considered day-to-day, likely will be held out of Friday's preseason game in Detroit, but his Week 1 availability doesn't seem to be in danger. The Giants are referring to Barkley's left hamstring issue as a "mild strain." Analysis: The team chose to address Barkley's status because he left practice early Monday after stretching out to make a catch. The running back's left leg was wrapped for the remainder of the session and subsequently examined. Per coach Pat Shurmur, the Giants plan to "be smart" with their prized rookie "as we move along here." His statement suggests that the team will employ a cautious approach, which likely foreshadows Barkley sitting out Friday's preseason game against the Lions. Barkley, who tweaked his hamstring at practice Monday, has indicated that he is fine, Dianna Russini of ESPN reports. Analysis: Per the report, the Giants don't seem too concerned about the rookie running back's injury scare. We'll consider Barkley day-to-day as Friday's preseason game against the Lions approaches. 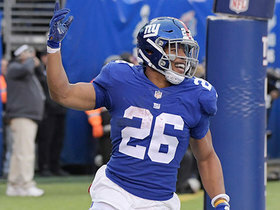 Coach Pat Shurmur said that he thinks Barkley -- who appeared to tweak his left leg at practice Monday -- is fine, Jordan Raanan of ESPN.com reports. "We'll find out," Shurmur noted afterward. Analysis: Initially, Barkley's leg was wrapped, but once Monday's practice was over, the rookie running back no longer sported the wrap, though did appear to walk off "gingerly," per Raanan. Consider Barkley day-to-day for the time being. Barkley was spotted on the sidelines with his left leg wrapped after jumping for a errant pass during Monday's practice, Jordan Raanan of ESPN.com reports. Analysis: No word yet on the severity of the injury, but it's worth watching pending more information from the team. Barkley rushed five times for 43 yards and wasn't targeted in the passing game during Thursday's 20-10 loss to the Browns in the preseason opener. Barkley signed a four-year, $31.2 million fully guaranteed contract with the Giants on Sunday, Ian Rapoport of NFL Network reports.